Don’t you just love Halloween? Appealing to both kids and adults, the spookiest night of the year allows everyone to have fun, indulge in sweet treats, and, best of all, dress up as all kinds of characters. Halloween costumes were once limited to the classic horror staples of ghouls, ghosts, witches, and zombies, but the tradition has grown and evolved over the years to include a myriad of themes, from fictional people to historical figures, modern memes, and everything in between. So if you are looking for some inspiration, here are the following year’s Top 50 Halloween Costumes, ranked. This brother and sister duo decided to trick or treating as their favorite Pokémon characters, Ash and Misty. This is just one super example of how siblings can match up their Halloween costumes on the same theme and have fun together, rather than choosing to have different costumes without any correlation. Alone, these costumes wouldn’t mean as much or look as good, but when combined, they become so much better. If you have a brother or sister, or even just a best friend, consider teaming up with them for your Halloween costumes this year. It’s a classic, but it’s always a big hit. The Lara Croft or ‘Tomb Raider’ outfit is a super way for video game loving girls or women to express their nerdy side while also living in the skin of one of the world’s greatest fictional adventurers. The signature braid, handgun, sunglasses, and shorts are key parts of this classic look, but there are many different incarnations of the character so that you can shake up the style with your personal touches. 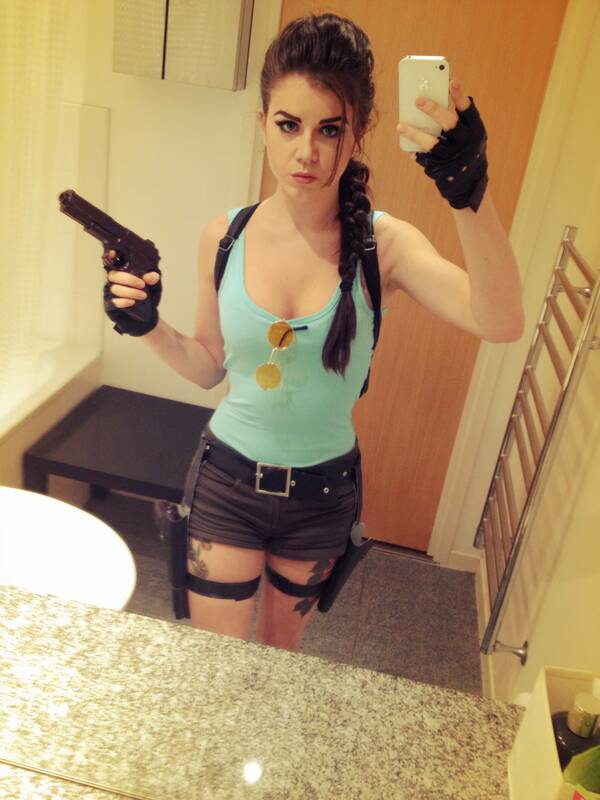 With new Tomb Raider video games being released, this costume is never going to go out of style. Pregnant women have a lot to deal with, but they don’t have to miss out on the fun of Halloween! If you have a creative mind and a strong imagination, there are dozens of cool ways you can incorporate a bulging belly into some cool and original costume ideas. This gumball machine themed outfit is a brilliant example. The 25 cent slot on the skirt is a nice touch, and the red beret on top keeps the color scheme going. The little gumballs are made from lots of colored balls of wall stuck to a simple white shirt. Halloween costumes can be enjoyed at any age, from 1 to 100! This adorable baby is the perfect proof of that. Since babies are typically bald and often a little chubby, it can be fun to play with that image by dressing them up as old men or similarly amusing outfits that make the most of their unique physical characteristics. 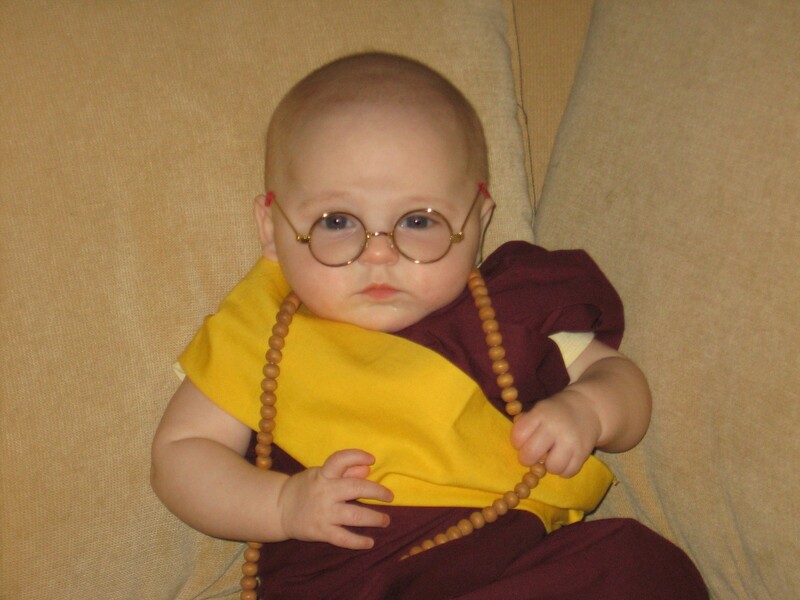 For example, this little guy’s parents decided to go for a Dalai Lama theme, complete with beaded necklace, robes, and glasses. The resemblance is pretty uncanny, don’t you think? The next costume is something super! We all know that Marvel and DC movies are more popular than ever before. Comic book characters were once beloved by nerds but are now adored all around the world, with movies like the Avengers series being among the most popular films ever released. Dressing up as your favorite hero for Halloween isn’t a bad idea, but what about inventing your hero, like this man? 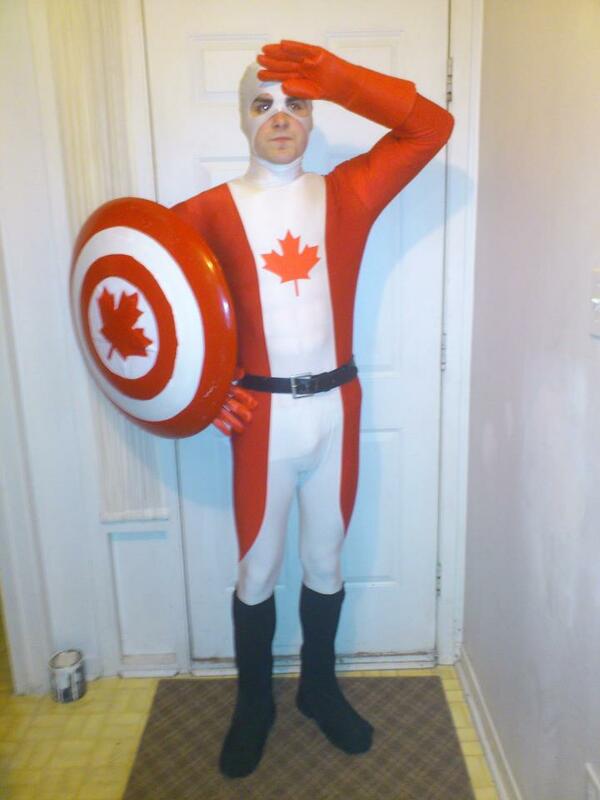 We all know Captain America, but this guy decided to invent ‘Captain Canada’ to honor his roots. He took the classic maple leaf design and even made his Cap-style shield. Here’s one for the Home Alone fans out there. 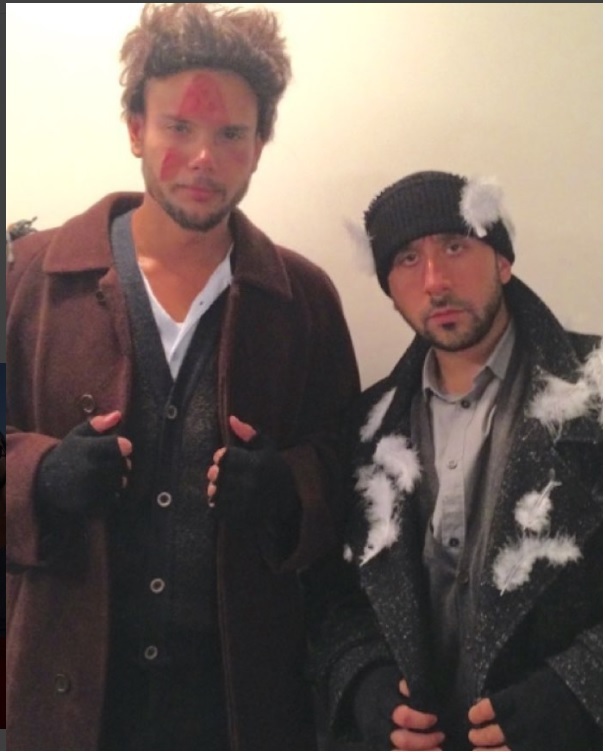 These two buddies decided to dress up as the famous ‘Wet Bandits’ from the Home Alone series of films, starring Macaulay Culkin. Instead of simply keeping their costumes simple, they even added in special effects to remind us of memorable moments from the films, like the iron falling on Marv’s face and all those feathers stuck to Harry. Movie characters are popular Halloween costume ideas, but it’s great to be original and try to think outside the box like these guys by choosing characters that we don’t see too often. The best costumes often come with additional accessories to resemble the item or character they’re trying to recreate, and that’s exactly what this costume does. This Barbie outfit is some next level Halloween style! 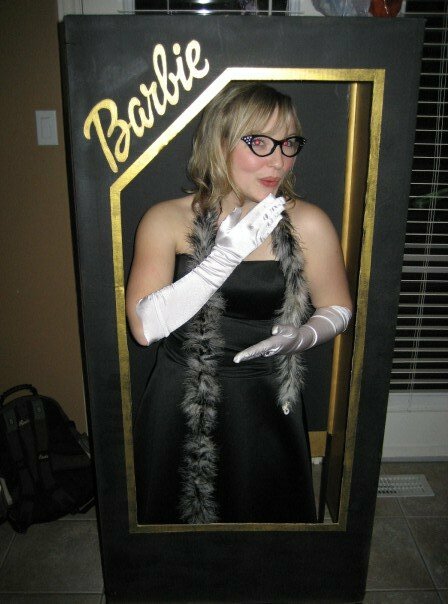 Not only has this woman gone to the trouble of dressing up as the world-famous Barbie doll, she even designed herself her box, looking like a life-size version of the real thing. She looks like she just fell off the shelf of a toy store! To top it off, she even struck a perfect doll-like pose for this photo. 43. Is This The Real Life? Movies, TV, and video games don’t have to be the only sources of inspiration for your Halloween costumes. Stepping into the skin of your favorite singer or musician can be a super idea as well. This guy looks just like a reborn Freddie Mercury, right down to the mustache, distinctive yellow jacket, and rock star pose. Recreating the style and look of an iconic music legend is a unique idea for a Halloween party or an evening of trick or treating. It’s also a good plan for groups of friends to dress up as different members of the same band. Ask anyone for their favorite family Halloween movie, and there’s a good chance they’ll answer with Hocus Pocus. It was a classic film that remains popular to this day, and these three friends decided to step into the roles of the three starring witches, Winifred, Sarah, and Mary, played by Bette Midler, Sara Jessica Parker, and Kathy Naimy, respectively. The makeup and costumes are fantastic in all three of these outfits, and the best thing about this set of costumes is that they’re all entirely in keeping with the theme of Halloween. Let’s be honest; memes are a big part of our lives nowadays. From ‘Distracted Boyfriend’ to the ‘Trollface,’ there’s a long and ever-growing list of bizarre, amusing little images, videos, and phrases that have become ingrained in popular culture. Dressing up as memes for Halloween is becoming increasingly popular, and as this outfit proves, it often doesn’t take a whole lot of work. 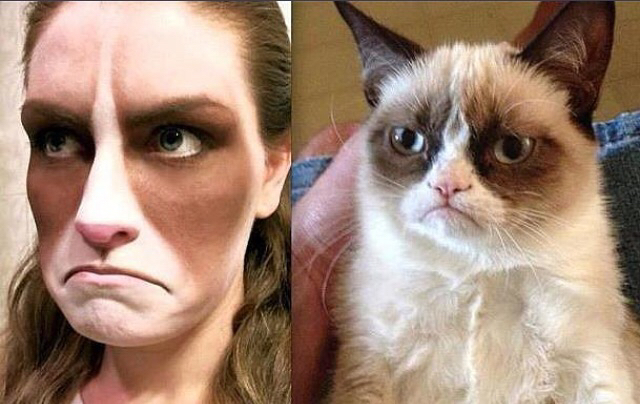 With some simple make-up and an angry pout, this girl successfully transformed herself into the world famous ‘Grumpy Cat.’ The only problem with this outfit? She had to pull that angry face all night long. If you have a big group of friends and all want to spend the spookiest holiday of the year together, there are dozens of awesome group costume ideas you can come up with. 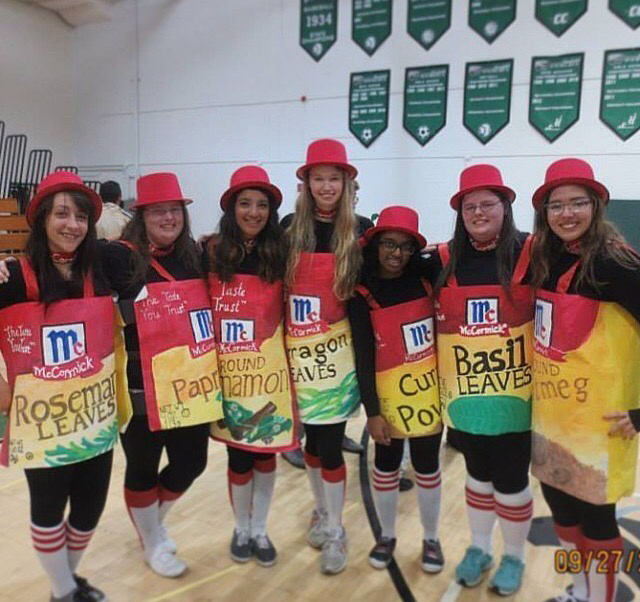 These girls brought a new definition to the ‘Spice Girls.’ Rather than dressing up in colorful outfits like the iconic British girl group, they decided to embody real-life herbs and spices like nutmeg, curry powder, and cinnamon. The best Halloween outfits often have a touch of humor to them, and this one made many people laugh on Halloween night. Tim Burton creations are a favorite theme on Halloween. After all, the famous director makes a whole lot of movies based on themes of death and the undead, giving us characters like Jack Skellington and Beetlejuice. This girl took her inspiration from the movie Corpse Bride, dressing up as Emily, the iconic bride, complete with one of the most amazing dresses we’ve ever seen. The level of detail in this costume is stunning, right down to the blue hair, skeletal arm, and floral bouquet, and this just goes to show what people are capable of when they’re willing to work hard on their outfits. Here’s a hilarious referential Halloween costume, proving that big laughs can come from only small amounts of effort. This guy painted his face gray and came to his Halloween party as the iconic ‘Wrecking Ball’ from Miley Cyrus’ famous song of the same name. To top it off, he attached a little scantily clad blonde doll to the top of his head, with a chain, just like in the clip. Many people tend to think that great Halloween costumes require hours of preparation and expensive materials, but this guy shows that the simplest outfits are often the best. The Netflix series Stranger Things has been a huge hit since its release, resonating with older and younger generations with its mix of 80s style, Stephen King-esque horror, and Steven Spielberg-esque direction. The stars of the show are its child cast, with Eleven, being one of the most popular characters. 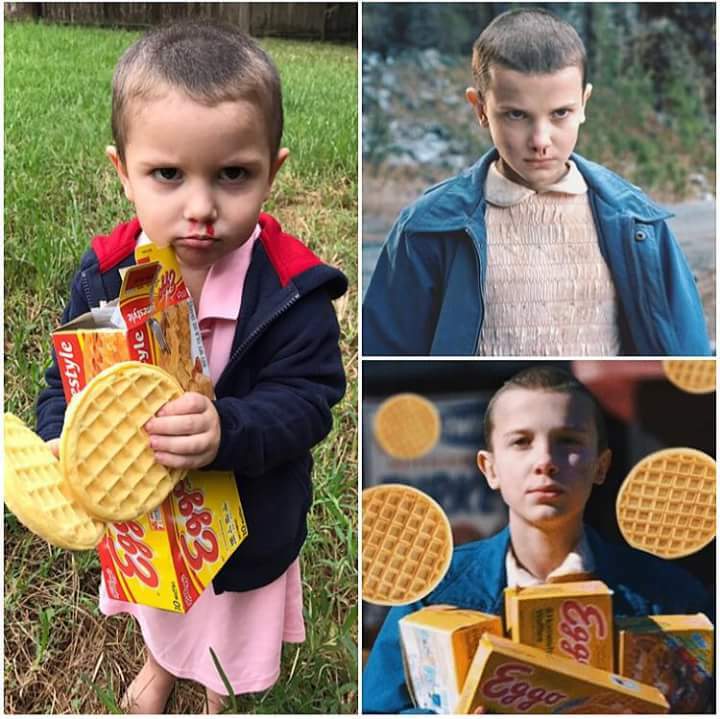 This little girl has nailed Eleven’s look, complete with a pack of her favorite snacks and nose bleed. Dressing up as a modern TV star is a great idea because everyone will get the reference and you won’t have to deal with people asking whom you came as all the time. Looking like they’re all about to dive into the Mystery Machine and solve a spooky crime, this group of girlfriends dressed up as the Scooby Doo cast for their Halloween party. Much attention has gone into each costume, with the colors of the clothes perfectly standing out and matching with the original cartoon. This group costume is great for multiple reasons. It’s well-made, it sticks to the spookiness that Halloween is known for, and it’s a perfect example of friends working together. It also shows that you can dress up as any character, regardless of gender. 35.	Who You Gonna Call? It’s time to call Peter, Egon, Ray, and Winston, as two of the biggest Ghostbusters characters are on the loose! These two party-goers decided to dress as Dana Barrett, aka the ‘Gatekeeper,’ and Louis Tully, aka the ‘Keymaster’ in the classic 1984 movie, Ghostbusters. The attention to detail in these two costumes is fantastic, right down to the frizzy 80s hairstyle of the woman and helmet of the man. This is a great example of two people taking inspiration from a classic film but thinking outside the box, not just going for the typical Ghostbuster ‘proton pack’ outfits. This couple has come up with a clever Halloween costume that could work for husband-and-wife or boyfriend-and-girlfriend duos around the world. Even brothers and sisters could copy this outfit or take inspiration from it. Based on the classic Grant Wood painting, American Gothic, these Halloween lovers dressed up in the iconic outfits and even carried a pitchfork and picture frame to ensure that everyone gets the reference. Picture frame outfits can be much fun, helping people dress up as iconic paintings and images and bringing ‘still life’ into motion. Nobody wants to spend Halloween evening having to answer that boring old question ” Who are you supposed to be?” so the best outfits need to convey recognizable characters without any place for confusion. This family-friendly outfit is simply perfect, bringing all of The Simpsons characters to life like never before. The huge white eyes and hair accessories for each member of the family have been perfectly-made, and the family had a smart idea of using yellow shirts and other clothing to recreate the iconic skin color of the animated American family, rather than relying on make-up or face paint. The next outfit is pretty controversial! 32. Blue and Black or White and Gold? This Halloween outfit will make many people laugh, especially those who spend plenty of time on social media networks like Twitter and Instagram. Not too long ago, a dress like this one caused a whole lot of chaos as people couldn’t decide if it was blue and black or white and gold. This woman chose to design her version of the dress and wear it on Halloween to confuse and confound everyone who saw it, triggering debate and controversy among every Halloween, party guest! 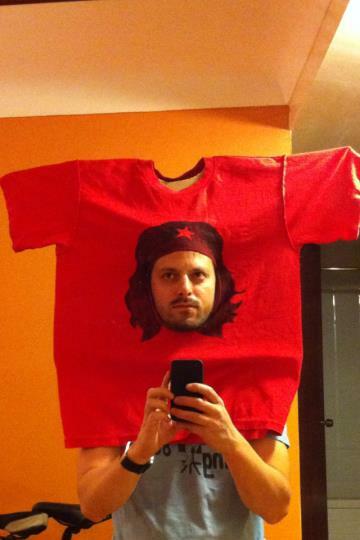 This is an excellent example of a topical Halloween outfit based on internet culture. Most people tend to agree that the 90s were a very special time, and nothing sums up that incredible decade quite like The Fresh Prince of Bel-Air. The famous TV comedy, starring Will Smith in the leading role, was a huge part of the 90s culture, giving birth to dozens of cult moments and memes that have remained part of popular culture ever since. 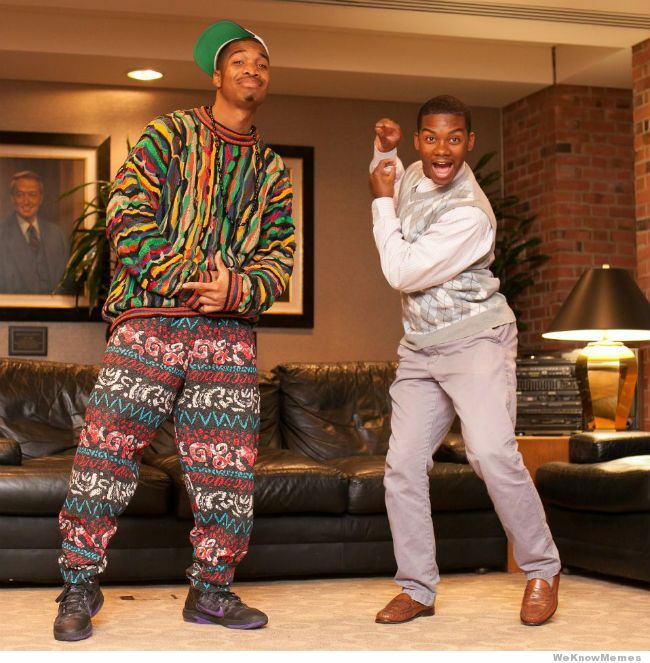 These Fresh Prince outfits are simply fantastic, encompassing all the charm and ridiculousness of the show and paying homage to two of the show’s stars: Will Smith himself and Alfonso Ribeiro in the iconic role of Carlton Banks. This is a super idea for a group of friends to try out together. The costumes don’t take too much effort to make, but the final effect is superb. 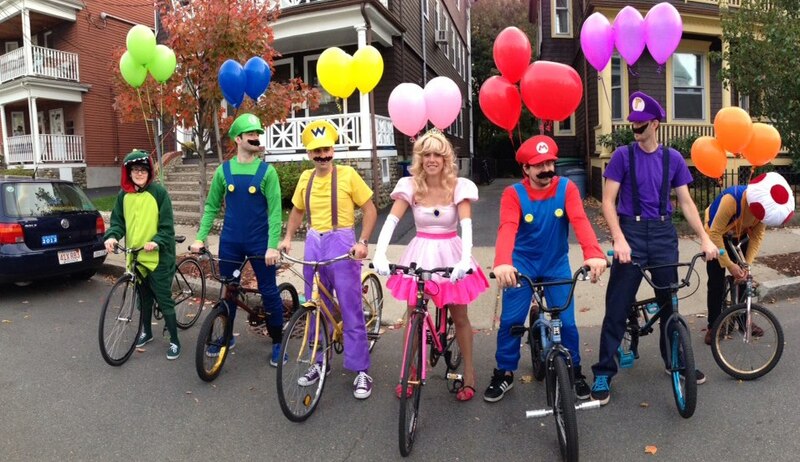 This group of pals has decided to dress up for Halloween as the Mario Kart gang, including Mario himself, his brother Luigi, Princess Peach, Toad, and Yoshi, as well as the villainous Wario and Waluigi. These outfits are bright and colorful, and the matching bikes and balloons add to the overall effect, proving that accessories can be a big part of any Halloween outfit. This girl might have been the inspiration for the Sun-Maid logo in another life. She’s perfectly imitated every aspect of the famous image, including the bonnet, hairstyle, and even the smile of the logo girl herself. This might seem like a strange costume idea, but plenty of people have copied iconic logos and foods over the years, and this is one of the best examples. We see logos every single day, so it can be a fun idea to dress up as one as Halloween, adding a unique twist to an image everyone knows. The next costumes is Gr-r-reat! For many parents, the fun of Halloween isn’t in picking costumes for themselves; it’s designing costumes for their kids. Many grown-ups don’t even like to dress up but will love making cute outfits for their little ones to wear. This parent had the smart idea of making a dual costume for them and their child. Based on the famous Frosted Flakes cereal, complete with the little baby dressed up as the brand’s mascot: Tony the Tiger. This costume is so clever, and the black suit worn by the parent is a great way to be part of the overall outfit without standing out. 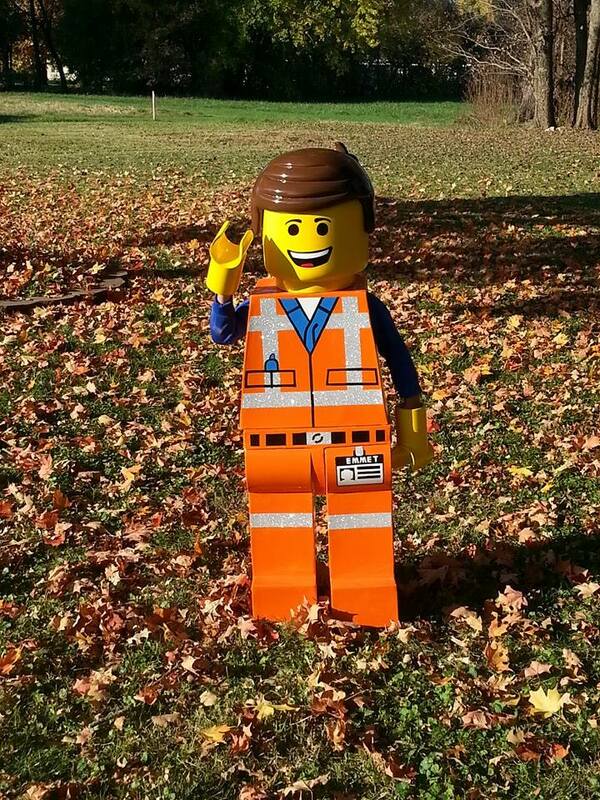 Nope, that’s not a life-size Lego man; it’s a little boy wearing a costume made by his father. Lego has been a popular toy for generations and remains huge with kids, even in the modern day of smartphones and video game consoles. This little boy, like so many others, adores Lego and his dad wanted to bring that love to life in a fun new way for Halloween, so he transformed his kid into a little Lego man. Taking inspiration from classic toys of the past is a super way to have some fun on Halloween. Some video game characters are simply iconic. Pac-Man, Mario, and Link are a few examples, with Megaman being another classic character that many older gamers fondly remember and younger games have grown to love too. 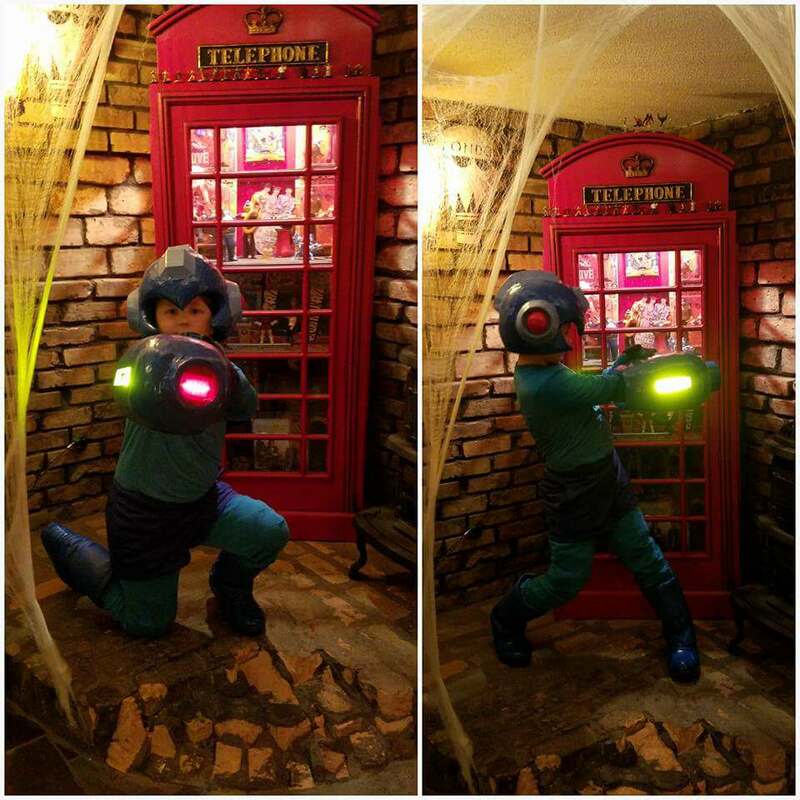 This little boy has one of the best Megaman outfits, complete with his light-up Mega Blaster, ready to shoot some bad guys and save the day. We’ve seen a long list of video game-based Halloween outfits over the years, but this is easily one of the very best, and any kid would love to have a big glowing accessory like that. 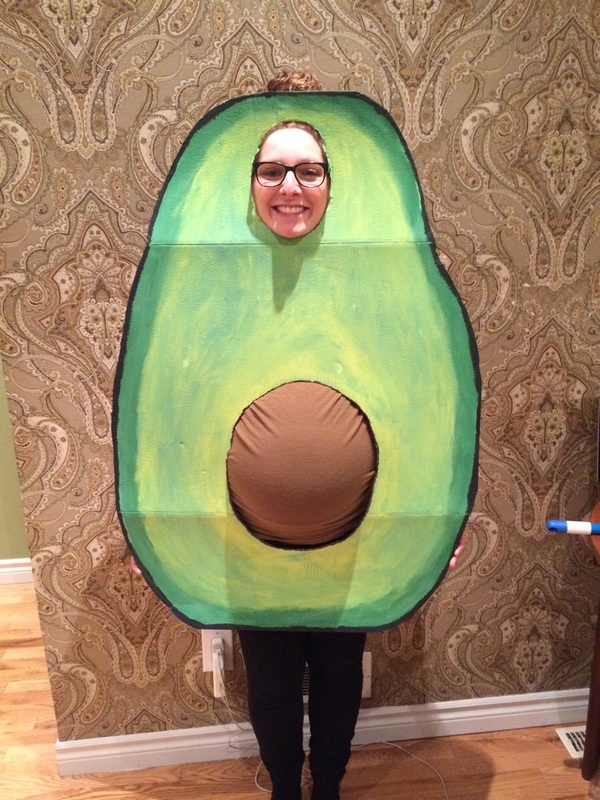 For one reason or another, avocados have become crazily popular in recent years, so this woman’s Halloween costume is both topical and hilarious. As we saw earlier, pregnant ladies don’t have to miss out on the fun of Halloween and can use their baby bumps in some pretty creative ways. This woman chose to make her belly the pit of the fruit by using a cleverly-colored T-shirt. The rest of the outfit was made very easily by simply cutting out a gap for the face and coloring the rest in various shades of green. Can you spot the next costume? This is a hilarious idea for a large group of friends to try together. These people all dressed up as the famous Waldo character from the ‘Where’s Waldo?’ Book series. Then, they went out into some crowded areas and parties to bring the iconic scenes from the books to life in some very amusing ways. As we can see, many of them even wear glasses to complete the look, and they’re all wearing striped tops, as well as the matching hats. This is an easy costume to make and will always be relevant. Here’s another super Halloween group costume idea for friends and families to try out. The ‘Green Army Men,’ featured in films like Toy Story, have been popular kids’ playthings for decades and plenty of people have tried to recreate these classic toys over the years on Halloween, but this group nailed the look. They even made themselves little green bases and covered everything single part of their outfits and faces in green to bring the look to life. The accessories and shiny plastic finish on each character’s coat and pants is simply perfect. Dressing up as classic characters from films, books, games, and TV shows can be fun, but many people insist that Halloween is a spooky holiday and should be celebrated with creepy costumes, rather than amusing ones. So, in the spirit of scariness, here’s one of the most spine-tingling dual costumes we’ve ever seen. These two girls dressed up as the terrifying twins from The Shining. They’ve got the perfect dresses for the occasion and matched up their looks to be almost identical. The creepy contact lenses and terrifying blood splatters complete the ensemble. From horrifying to hilarious, this Halloween outfit deserves a round of applause. We’ve all seen so many people wearing that classic Che Guevara T-shirt over the years. The shirt has become so ubiquitous that this guy decided to make himself part of the shirt for Halloween, even going as far as growing a little beard for the occasion. The shirt is held in place with a cardboard frame, and this just goes to show that dressing up as an inanimate object might seem impossible, but if you’re creative enough, anything is possible. Celebrities often attend some very exclusive Halloween parties and have the means to pull off some of the very best Halloween costumes ever. 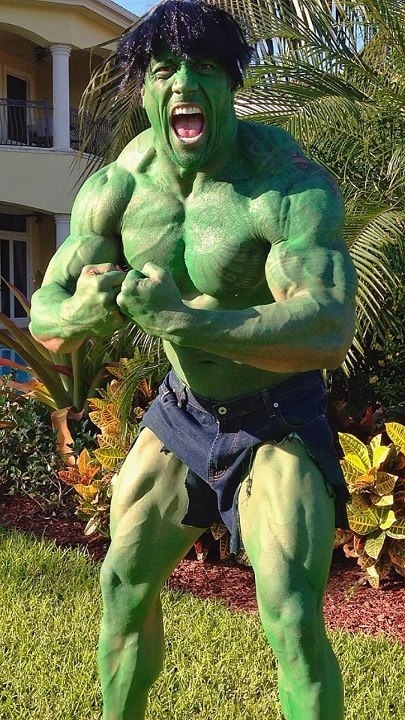 Here, we see Dwayne ‘The Rock’ Johnson heading off for some Halloween fun as the Hulk after painting his whole body green. Obviously, Dwayne’s enormous muscles, built up over a lifetime as a wrestler and action movie star, help to nail this look, but he’s also gone to the trouble of finding a great wig and perfectly ripping up some old denim shorts, proving once more that simple accessories can make or break a Halloween outfit. Here’s another great dual costume idea for siblings, best friends, or couples. This example shows a married couple, with the husband wearing a bald cap to cover up his hair and dressing up as the supervillain Gru from the Despicable Me movies, while his wife has made herself a simply amazing Minion costume. Since Halloween is such a scary occasion, the Minion outfit was made to look like he’s screaming non-stop, and these two costumes go well together. Each part of these costumes has been chosen with much care to match the animated movies. This outfit is two great ideas all in one. This very smart Halloween party-goer decided to dress up as ‘Amazon Prime.’ We’re all familiar with the premium Amazon service, but the guy decided to add a twist to the idea by mixing it up with the famous Transformers character, Optimus Prime. He used old Amazon boxes and simple tape to turn himself into a robot, basing the design on Optimus Prime but using Amazon-based ideas to keep with the theme he’d chosen. Many people laughed at this one. This one took much effort to make, but the result is simply staggering in all the right ways. 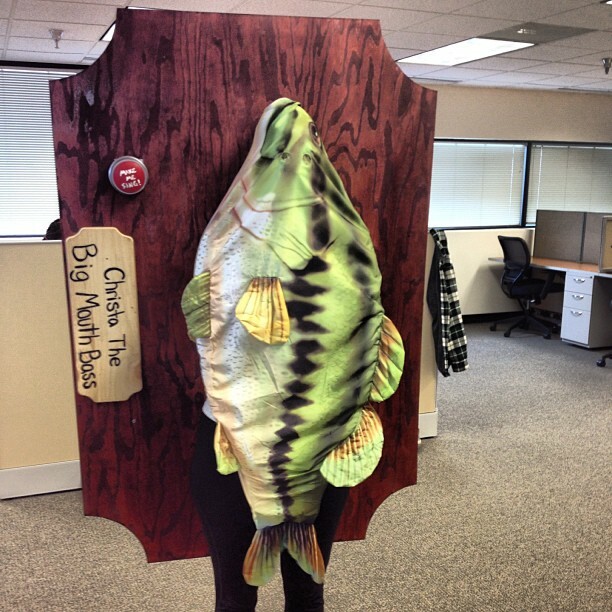 This woman decided to dress up in her variant of the hilarious Big Mouth Billy Bass singing prop fish, popularized in the early 2000s. The real-life prop is a latex bass that sings songs and moves around at the push of a button, and this costume perfectly recreates every single aspect of the toy, from the wooden backing to the bright red ‘Make Me Sing’ button. Due to the way the costume is designed, it was even possible for the woman to recreate Billy’s famous dance moves. Keeping in the spirit of Halloween, this man made himself a terrifying costume, creating a fake headless body holding a large cardboard box that he could hide inside, giving the impression that he’d lost his head before jumping out of the box to surprise and spook passers-by. Much work goes into a costume like this, but the result is worth all that time and effort, and it’s a very fun example of trying to make an optical illusion work in Halloween costume form, as it does look like the body holding the box is all real. Here’s another of Tim Burton’s macabre characters brought to life by a talented young Halloween-lover. This little boy got all dressed up as Edward Scissorhands, famously played by Johnny Depp in the film of the same name. This costume is simply incredible, right down to the finest of details. The makeup is perfect, the hands themselves have been perfectly crafted using plastic utensils to avoid any risk of accidents, and the leather suit is almost a mirror image of the one used in the film. Even the wild, out-of-control hairstyle seen in the movie has been captured here. 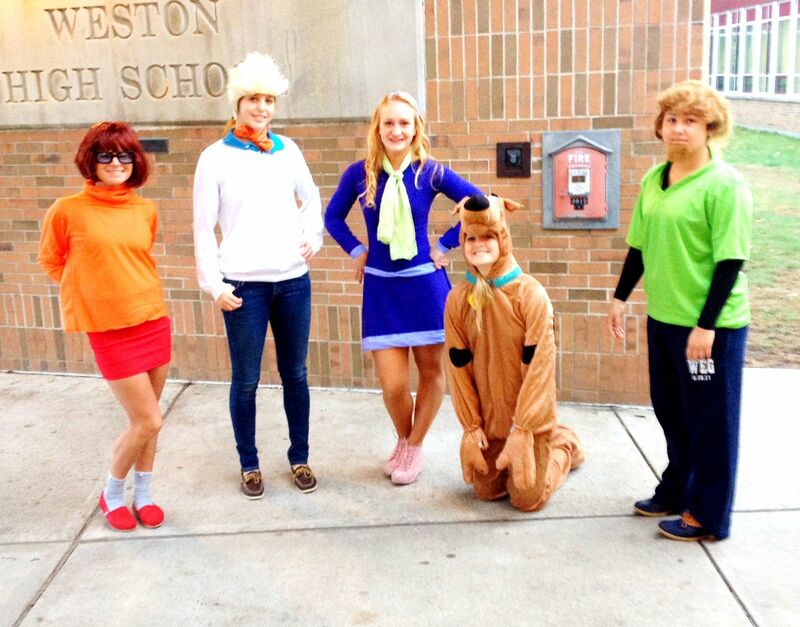 These girls are too talented for words and had an amazing Halloween group costume idea. To honor one of the world’s best comedic actors, Jim Carrey, the group of friends decided to each dress up as an iconic Carrey character from classic movies like The Cable Guy and Dumb and Dumber. From left to right, we have Mr. Popper, Lloyd Christmas, Chip, The Mask, The Grinch, Ace Ventura, and The Riddler. Each costume has been crafted to perfection down to the finest detail, with lots of excellent accessories to bring them all to life. 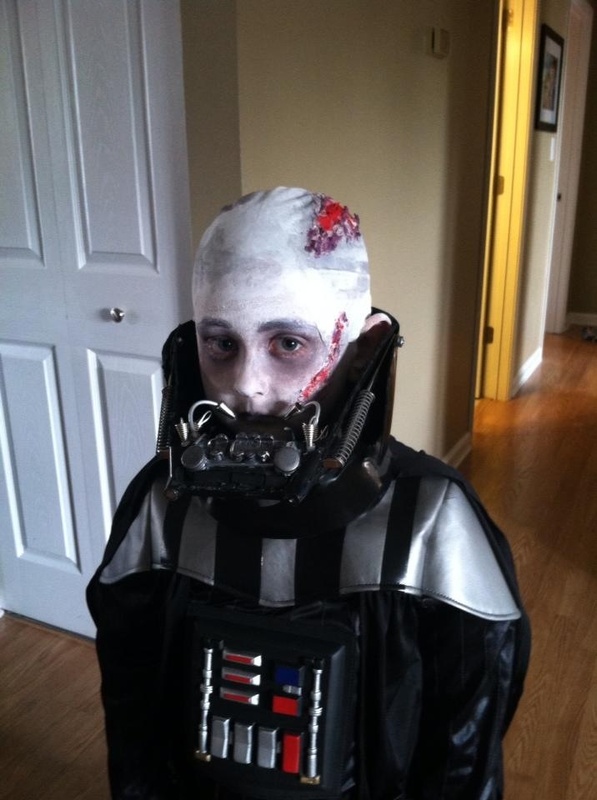 The force is very strong with this young man, who decided to go out trick or treating as a battle-damaged Darth Vader, seen very briefly in the original trilogy of Star Wars movies. Many people like to dress up as Star Wars characters on Halloween, but a lot of Vader costumes include the classic mask to keep it simple. This kid and his parents went above and beyond the call of duty to make the costume extra special and extra creepy, especially with that horrible head wound and eerie eye makeup. We’ve seen a few examples of Halloween costumes based on regular, everyday objects, but this one is taking things to a whole new level. This boy decided to dress up on Halloween as a penny! 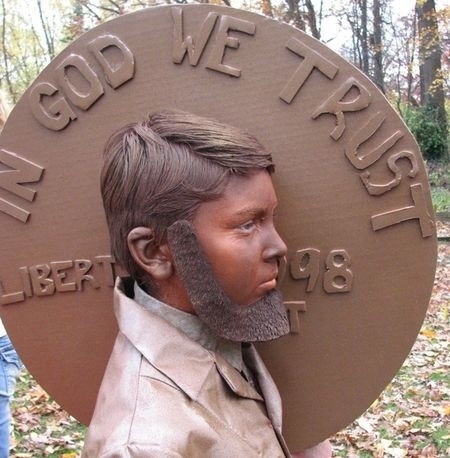 He crafted a large circular shape and glued on the letters of ‘In God We Trust,’ as well as dressing himself up as Abraham Lincoln. He painted his face just the right shade and even made a perfect Abe beard, before posing dramatically alongside the rest of his outfit for this perfect picture. The spray-painted suit also helps to complete the costume. This astonishing Halloween costume shows what people can are capable of when they’re extremely skilled with the use of makeup. This man’s outfit is just astonishing, creating a scarily realistic optical illusion that makes it look like his skin can be zipped or unzipped, effectively opening up the lower portion of his face. In reality, the whole thing has been achieved with the clever use of small accessories, shading, and different colors of makeup and paint, but the overall effect is mind-blowing. You’d get a real fright if you bumped into this guy in a dark alley on Halloween night. We’ve seen a few costumes making use of frames and taking inspiration from classic paintings of the past, and this is another excellent example. 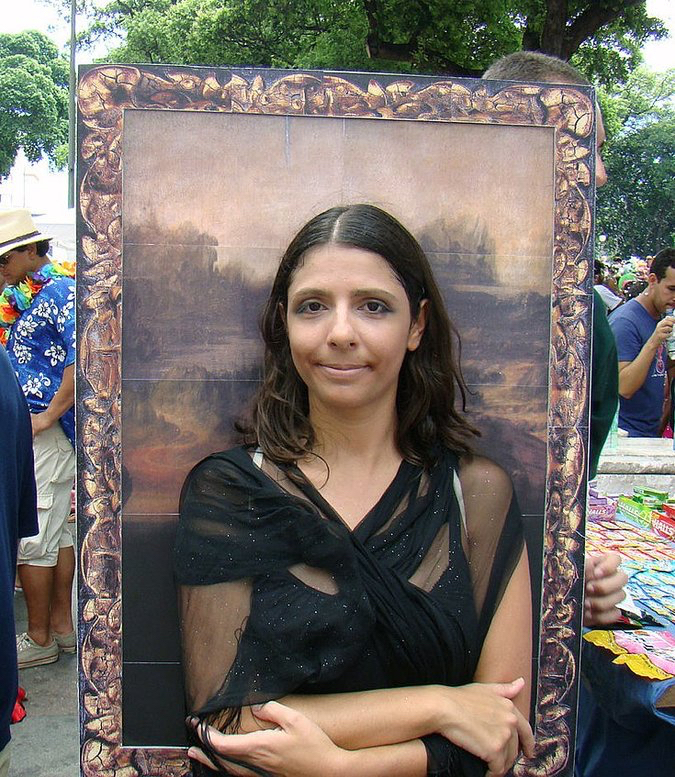 This woman attended Halloween celebrations dressed up as the iconic Mona Lisa. Painted by Leonardo da Vinci in the 16th century, this image is recognizable all around the world, and this lady captured every aspect of the artwork, right down to the slightly mysterious smile of the unknown female figure. She found a great dress to match the portrait as well, styled her hair just right, and used some eye makeup to bring the whole thing together. Taking inspiration from the 1988 Tom Hanks movie ‘Big,’ this man decided to dress up for Halloween as the Zoltar fortune telling machine that helps Hanks’ character gain the body of a grown man despite being 12-years-old. 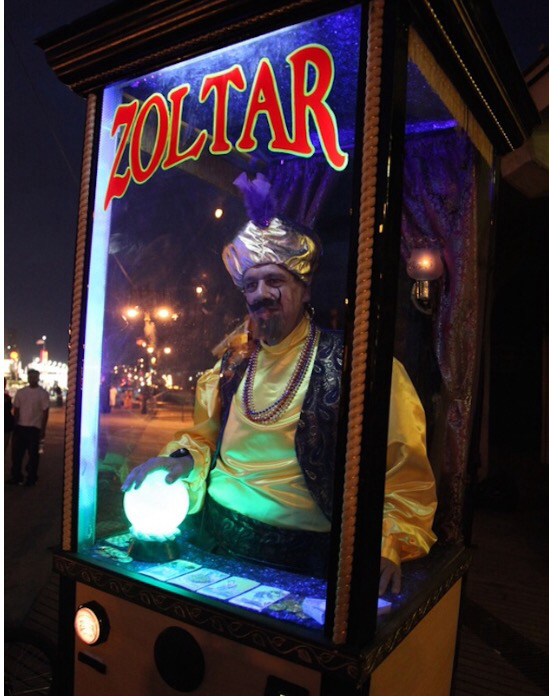 The costume is impressive enough by itself, with perfectly chosen attire and accessories, but the fact that they made a full Zoltar machine, complete with glowing lights and crystal ball, really takes this costume to another level. The only problem with this outfit is that the man had to stand still for a long time and couldn’t move anywhere! The girls we saw earlier dressed up as all those classic Jim Carrey characters are back once more. This time, they’re honoring another legend of comedy: Will Ferrell. Buddy the Elf, Chazz Michael Michaels, Mugatu, Ron Burgundy, Steve Butabi, Jackie Moon, and Ricky Bobby, all feature in this group costume, from movies like Zoolander, Talladega Nights, Anchorman, and Semi-Pro. As with the Carrey costumes, these outfits are all highly detailed, with lots of great little accessories and bright colors to help them all stand out from the crowd. If you and your friends all love the same star, why not try something similar? This Halloween costume has it all. It’s a perfect blend of accessories, style, and comedy. 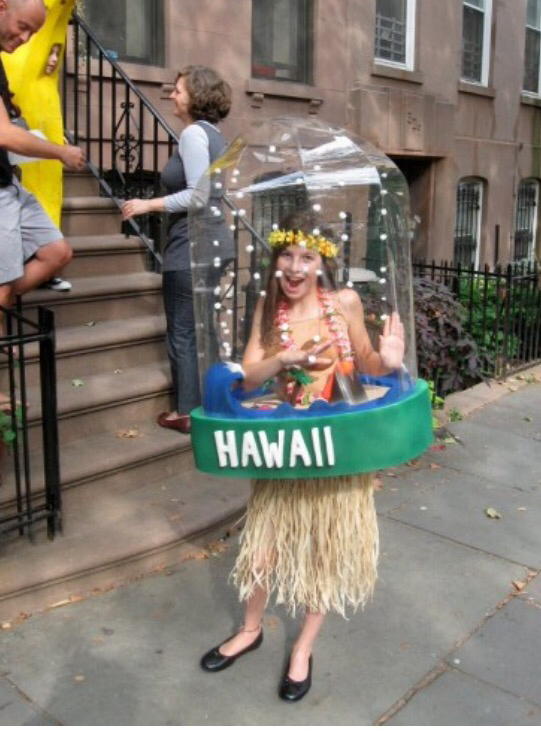 Fitted out with a hula dress and a lei around her neck, this girl has captured the lively spirit of Hawaii and is even performing a little dance for the camera, but then her outfit reaches new heights with the additional of a full snowglobe, complete with suspended snowflakes that seem to be falling through the air. The waves around the rim of the globe are another super touch, and it’s clear that much hard work went into the creation of this crazy costume. Another excellent and hilarious dual costume for friends, siblings, or relationship partners to take inspiration from. 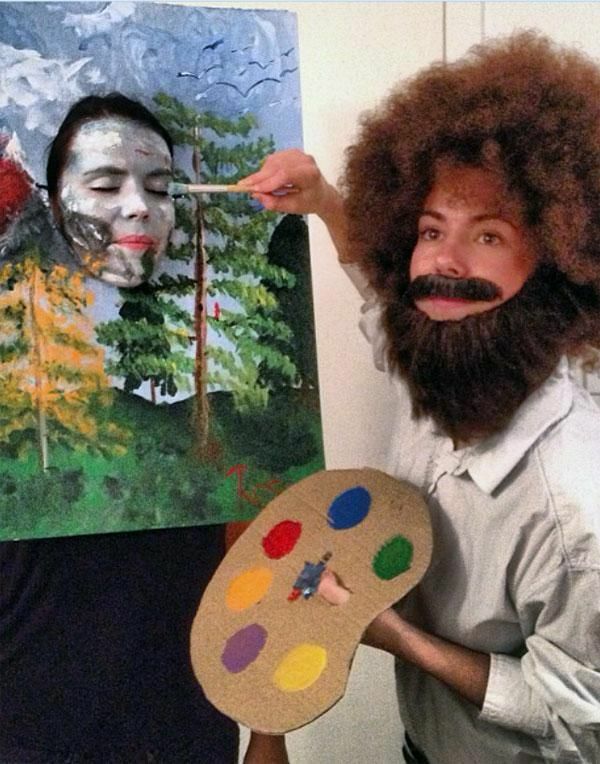 This costume shows one person as Bob Ross, the iconic friendly painter and TV host who has become an internet phenomenon in recent years, while the second person plays one of Ross’ paintings. The accessories, like the paintbrush and palette, help to connect the two parts of the costume, and the Bob Ross wig and beard are simply awesome. The painting itself is very good too, showing the traditional sort of landscape that Ross always loved to paint. Regarding attention to detail, it’s hard to find a better Halloween costume than this one. This man looked back through the history of the art world to one of the greatest painters of all time: Vincent Van Gogh. 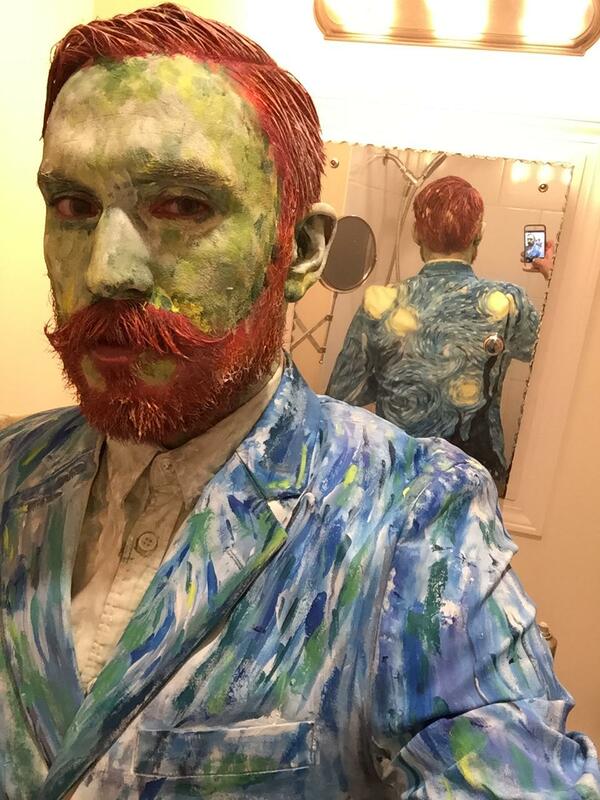 He took inspiration from Van Gogh’s various self-portraits to decorate his face and jacket, using the artist’s distinctive style and repeated brushstrokes in various colors and shades to achieve an amazing effect. Then, he went even further by creating his variant of ‘The Starry Night’ on the back of his jacket too. We saw a similar costume to this one earlier on, in which a man had made a fake body to carry around his head in a box, but the effect of this one is even stronger. This boy has the advantage of being quite short, allowing him to fit snugly into this fake body costume and make it seem like a grown man is walking around with a decapitated head in a jar. The creepy makeup on the boy’s eyes and lips are a great touch, along with the cotton balls to disguise his neck. This Halloween costume is amazing for a long list of reasons and wonderfully shows that every child can have fun on Halloween and take part in the festivities, regardless of any disability. 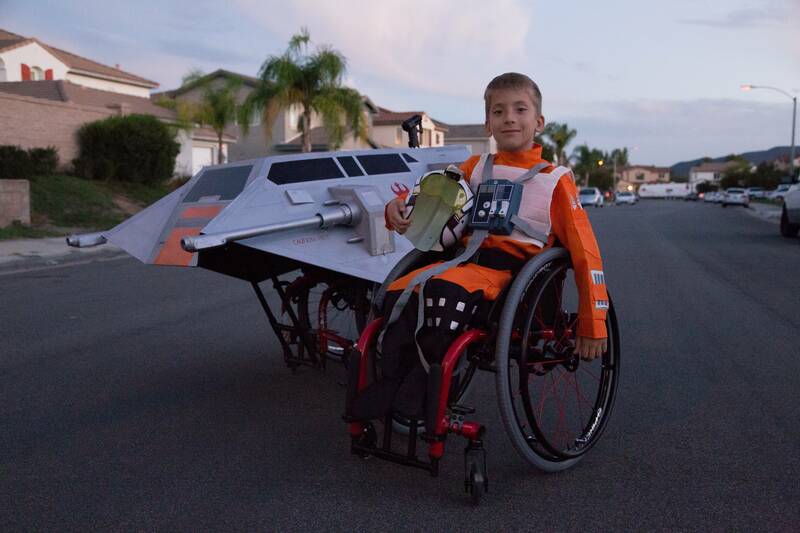 This young man might be in a wheelchair, but that hasn’t stopped him having the best costume in the whole neighborhood! He’s dressed up as a Star Wars snow speeder pilot, complete with his very own snowspeeder attached to the side of his chair. The level of detail in this outfit is jaw-dropping, and it looks like he just came off the set of the latest movie in the franchise. 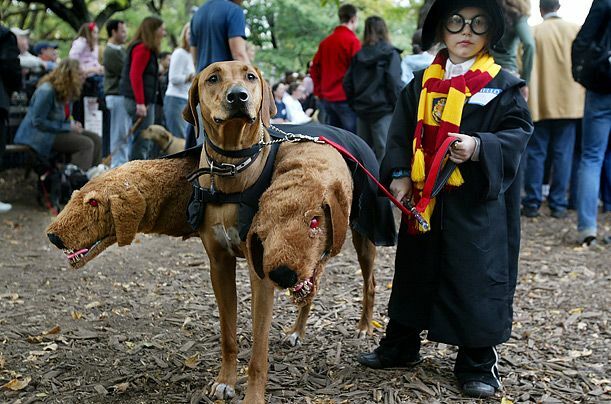 This Halloween costume is another big winner and shows that even our furry friends can join in on the Halloween fun! The young child in this scene is dressed up as a student at Hogwarts School of Witchcraft and Wizardry from the Harry Potter books, complete with magic wand and Harry-style glasses, but the dog is the real star of the show. Two additional angry heads have been added either side, matching in tone with the real dog’s fur, to create the character of Fluffy, the vicious three-headed hound who appears in the first book in the series. Heidi Klum has developed a reputation for being the Queen of Halloween. Each year, the German model and fashion star come up with an astounding new costume idea to wow the world. This skinless outfit was her greatest creation, giving us a creepy look at what lies beneath the surface of the average human body. It’s scary; it’s detailed, it’s eye-catching. In short, it’s one of the best Halloween costumes ever made, and we’re excited to see if Heidi can ever come up with a costume even better and creepier than this one.